At the end of October, the world's first Audi used car:plus centre was inaugurated in Eching, Munich. At this location up to 1,000 "young" used vehicles await new owners. 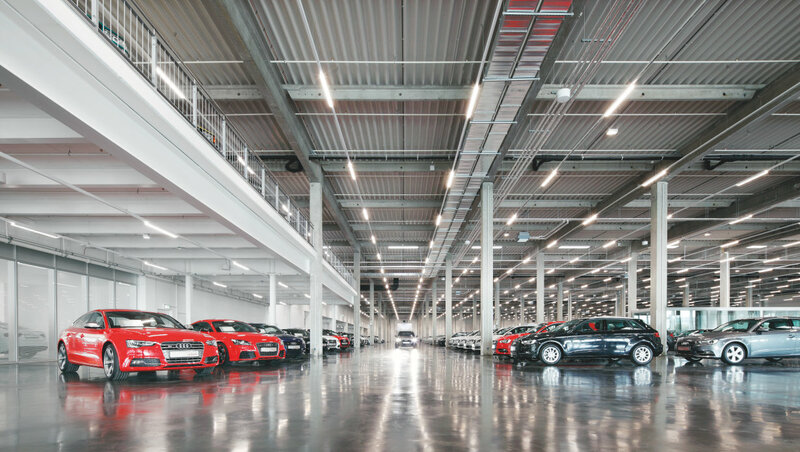 The sales area of 45,000 square metres is subdivided into a classic Audi terminal, a showroom with 17,000 square metres and open areas outside. Also interesting: Only LED lighting solutions have been installed according to the Audi slogan of "Vorsprung durch Technik". The area-specific power consumption is significantly reduced in this way. As with the Audi terminals for new vehicles, the terminal in Eching features the corporate architecture developed by the offices of Allmann Sattler Wappner with generous fenestration and dynamic, asymmetric curved spaces. The used vehicle showroom, sales area, accessories store and workshop are accommodated over two storeys. Project-specific ceiling washers from Siteco are integrated into the curved walls. With upward narrow light distribution and a colour temperature of 5,300 K, they ensure homogeneous brightness for the space with reflection via the ceiling. Their diffuse indirect component is very important for form recognition of the vehicles. Details are highlighted with direct light from Lunis® SL LED downlights featuring pan-and-tilt adjustment for precise illumination of the exponents. Special value was placed on the vehicle handover area. Here light fields equipped with a Rentex foil are integrated into the ceiling with OSRAM DRAGONchain® tunable white LED light modules. With a DALI touch panel, the colour temperature of these light fields can be modified between 2700 and 6500 Kelvin – individually according to the specific colour of the vehicle. Reception area, shop and ancillary rooms are equipped with Lunis 2® micro and mini LED downlights, and Novaluna® LED luminaires ensure classic office lighting that is simultaneously suitable for work with computer screens. Modario® trunking with IP20 LED modules have been installed in the workshop area. Up to 500 vehicles are accommodated in the large showroom. To illuminate this large space efficiently, 20 Modario® trunking units were installed, each with a length of 150 metres, and each with 30 symmetric wide distribution IP20 LED modules. Thanks to simple mounting of the system with rotary catches, the installation company needed only two days for the 600 inserts. The lighting system can also be controlled via the integrated DALI interface according to the specific needs and flow of visitors. As with other Audi terminals, project-specific light pillars were used in Eching, although here for the first time with LED technology. With a mast height of 7.5 metres they supply general lighting, and at a height of 6 metres they specifically illuminate the used vehicles displayed outside. Siteco Streetlight 10 LED road luminaires ensure safe driving and good visibility on the access drives and parking spaces.